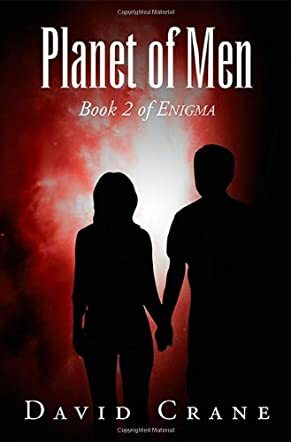 David Crane is back with book two of Enigma: Planet of Men. In a world of powerful demigods, one man must take on the burden of being a rebel messiah. Peter Blackwood never wanted to play God with these people but he had to play by the alien red cloud’s rules or risk having the colony destroyed. Failure was not an option: not when it came to playing the alien cloud’s games and not when it came to the invasion of tyrannical overlords. All Peter wanted was to live peacefully and find a home, a place to belong to. To do so, he has to play the game and win the war, but at what cost? David Crane has managed to create a complex, interesting fictional world in his Enigma books. He has created a unique world where the people are like chess pieces on a board, planted there by an invisible, constantly observing force, which in this case refers to the alien red cloud. The invisible force watches as these people make their own choices and fight for the right to live freely. Peter Blackwood embodies the desire of the people for equality and to fight against the tyrannical overlords who wish to own the planet with their godlike powers. When people with power become too greedy, someone will rise up to fight them. Planet of Men showed me an interesting perspective on humanity and mortality. It highlighted the struggles, sacrifices, choices, and mistakes people make in the most important fight of their lives. The way the story events were woven together is nothing short of amazing and David Crane’s writing made it easy to see and understand the entire events unfolding through the eyes of his characters. Planet of Men is truly a worthwhile read.